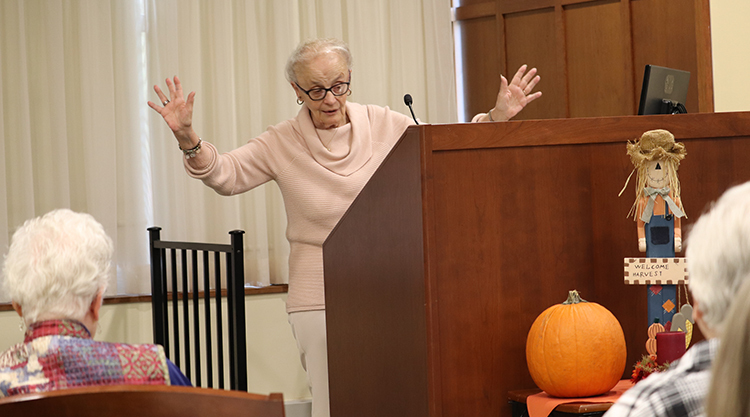 November 5, 2018, Adrian, Michigan – About 100 Catholic Sisters from most of the 19 religious communities serving in the Diocese of Lansing, Michigan, gathered October 20 at the Adrian Dominican Motherhouse. The annual event, coordinated by the diocesan Office of Consecrated Life, offers the women religious the opportunity to get to know each other through a program of prayer, lunch, conversation, talks, and Mass. Grand Rapids Dominican Sister Rita Wenzlick, OP, Delegate for Consecrated Life for the diocese, also welcomed participants. Inspired by a talk by noted speaker and author Sister Joan Chittister, OSB, on the application of the Rule of St. Benedict to modern life, Sister Rita undertook a similar study of the Rule of St. Augustine, adopted by St. Dominic. Sister Rita discussed five points about the Rule of St. Augustine and how Sisters can live them out today. While the Rule of St. Augustine calls on Sisters to “dwell peacefully in the convent and to be of one heart and one mind in God,” Sister Rita said, many Sisters today live alone or in smaller groups. Still, they can “be of one heart and one mind” by faithfully living out their community’s vision or directional statements, she added. The Rule of St. Augustine noted that “everything was held in common, and distribution was made to everyone according to his need,” Sister Rita said. Today, she said, Sisters “struggle to develop a strong sense of communal and personal inner authority” to balance their own needs daily with those of their community. Sisters today must discern “where we will minister, to whom we will minister, and what is needed for us to feel fulfilled in our ministry,” she said. While the Rule of St. Augustine calls on Sisters to travel and remain together at all times, many Sisters today live and travel alone, Sister Rita said. “We can be very uncomfortable in many kinds of circumstances because we’re there alone,” she said. She encouraged Sisters to be open to living and ministering with Sisters of other communities, without compromising on their community’s identity. The Rule of St. Augustine suggests that religious gauge their spiritual progress by their concern for the common good. Sister Rita noted that Sisters today live out that call through their ministry to those in need. “We always have to be reminded that it is for the promotion of the well-being of all – not for ourselves, but for all,” she said. 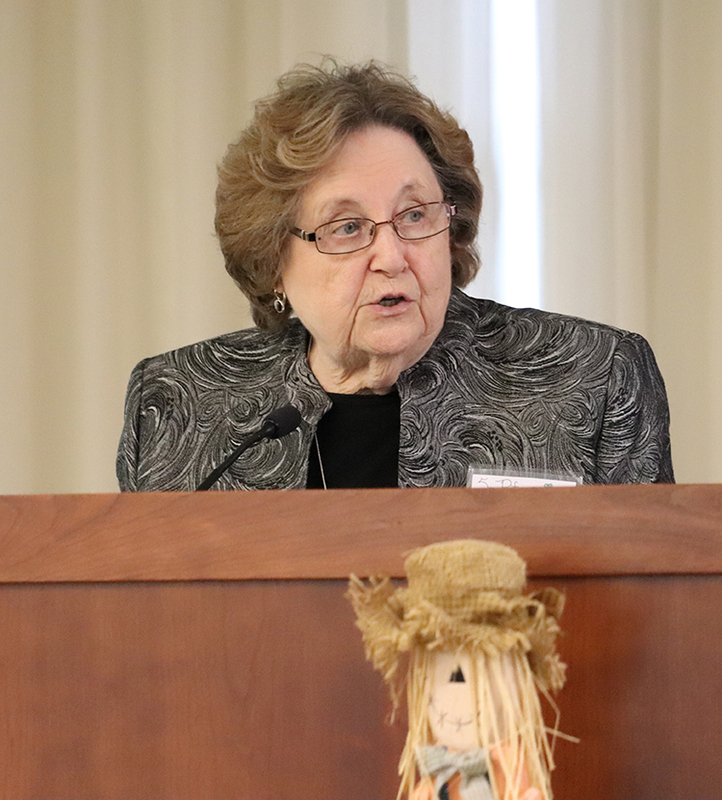 After lunch, Adrian Dominican Sister Marietta Churches, OP, focused on the theme of the gathering, “Celebrating You.” Noting that Sisters often focus on their failures or short-comings, she encouraged the Sisters instead to focus on their gifts from God. “We are wonderful women – we are W-squared,” she said. Noting that she had never ministered in far places such as Africa or the Philippines, Sister Marietta said that she had been privileged in 1994 to help with the foundation of St. Mary Magdalen Parish in Brighton, Michigan. She encouraged the Sisters to discern where they might be called in the Church. “I just think that we can make a dynamic impact on the Church,” she said. She encouraged the Sisters to affirm one another rather than to find fault in small matters. “You’re chosen, wanted, and blessed,” she told the Sisters. Sister Marietta concluded by leading Sisters in an exercise in which they quietly wrote down their own gifts from God and discussed their gifts with the others at their table. 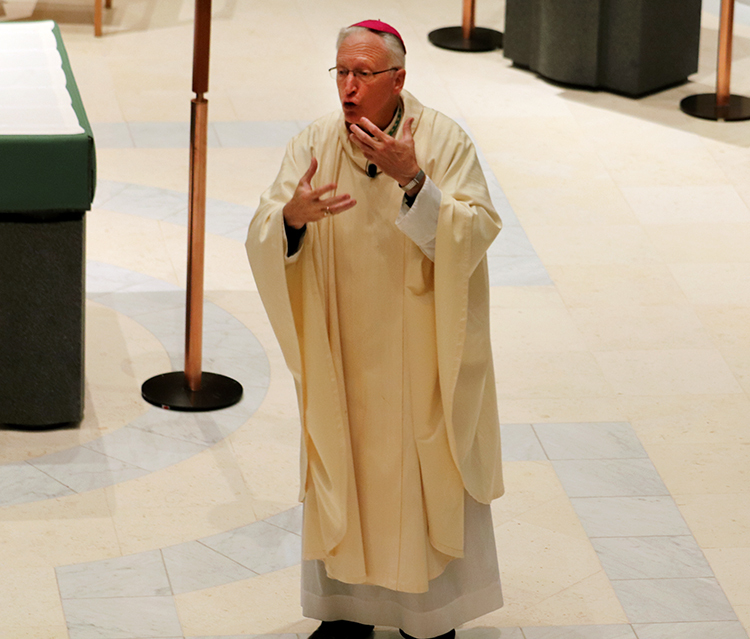 Bishop of Lansing Earl Boyea delivers his homily during the closing Liturgy in Holy Rosary Chapel. Single Catholic women who feel called to religious life should contact the Vocations Office in her home diocese or the religious community to which they feel a call. Dawn Hausmann, Director of Consecrated Religious Vocations for the Diocese of Lansing, can be reached at 517-342-2506. Those interested in vowed life as an Adrian Dominican Sister should contact one of the Co-directors of Vocations: Sister Tarianne DeYonker, OP, 517-266-3532, tdeyonker@adriandominicans.org; and Sister Mariane Fahlman, OP, 517-266-3537, mfahlman@adriandominicans.org. Feature photo (top): Sisters serving in the Diocese of Lansing work on a project to identify their gifts during the annual gathering of Sisters.